EXCLUSIVE! 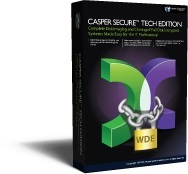 Only Disk Cloning and Imaging Solution Designed Specifically for Windows™ BitLocker™ and Symantec™ (PGP™) Drive Encryption Technologies — Casper Secure Tech Edition completely eliminates the unnecessary downtime and security and compliance risks associated with other disk cloning and imaging products. EXCLUSIVE! Ensures 100% Compliance with Existing Security Directives — Casper Secure Tech Edition never places data in an unprotected state, ensuring sensitive data always remains 100% compliant with enterprise-wide security directives and HIPAA requirements. EXCLUSIVE! Fast Encrypted Disk Upgrades and Replacements — Casper Secure Tech Edition quickly duplicates an encrypted drive to a larger or smaller drive without requiring a laborious and time consuming backup, restore and re-encrypt process. Rapid Backup, Re-imaging, and Recovery — Casper Secure Tech Edition captures, stores, and restores all data in its original encrypted state, completely eliminating the need to separately decrypt a drive prior to imaging or cloning or separately re-encrypt a drive after restoring. Saves Time — Casper Secure Tech Edition makes it possible to safely upgrade, replace, back up, restore, or re-image an encrypted drive in about the same amount of time as an unencrypted drive rather than the 10 or more hours typically required when using other solutions. Saves Time — Casper Secure Tech Edition makes it possible to safely upgrade, replace, back up, restore, or re-image an encrypted drive in about the same 30 to 60 minutes required for the typical unencrypted drive rather than the 10 or more hours required when using other solutions. EXCLUSIVE! Unparalleled Safety and Dependability — Casper Secure Tech Edition's exclusive AccuClone™ and Automatic Copy Verification technologies bring dependability to a new level by automatically verifying the integrity of the disk image during the disk cloning and imaging processes. EXCLUSIVE! Convenient and Easy to Use — Casper Secure Tech Edition runs directly from a USB flash drive or CD without installing any software or making any modifications to the system on which it is used.